Tennis superstar Venus Williams has been announced as the keynote speaker for this year’s Milestones Luncheon that’s happening this fall on November 16th at the Hilton Anatole in Dallas, Texas. This annual fundraiser occurs each year to benefit the Junior League of Dallas Community Service Fund that assists in gathering money for the organizations that the Junior League supports. Each year the hosts of this event always manage to get a speaker of great prestige, and they were very honored that Williams was willing to participate. The 22 overall Grand Slam singles champion became a professional tennis player at the young age of 14, and has been dominating several aspects of the tennis world alongside her little sister, Serena Williams. The sisters have won more Olympic gold medals than any other female tennis players in history, and Venus is the only woman other than Helen Wills Moody to win medals in both singles and doubles events in the same Olympics event. Williams is scheduled to travel to Dallas later this year to take part in the annual Milestones Luncheon, and it’s sure to be a big hit with the locals and fans alike. With the tennis star’s help, hopefully they will have a lot of success in this venture. 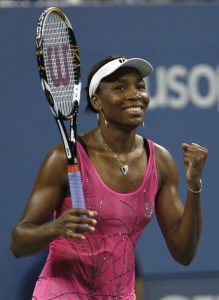 If your company is interested in finding out availability and booking fees for a professional tennis player like Venus Williams, or other sports celebrities for a Keynote Speech, Product Promotion, Guest Appearance, or Tennis Camp, call us at 1-888-246-7141.